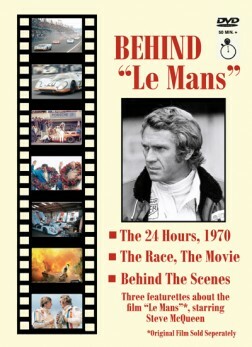 Behind Le Mans - The Film In Photographs - Autosports Marketing Associates, Ltd.
Click HERE for information on the Behind Le Mans DVD. 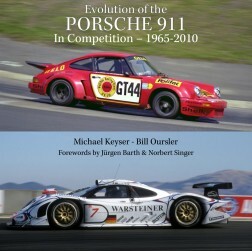 Produced and distributed exclusively by: Autosports Marketing Associates, Ltd. Most of the images are by Nigel Snowdon, who I learned, played himself in the film. He was the photographer doing in the film what he did in real life, shooting pictures of what was happening. Those pictures, shot during the filming of Le Mans add yet another dimension to our knowledge of the making of the movie, a story with a far more interesting plot than the one contrived for the film. (If you haven’t read Michael Keyser’s “A French Kiss with Death”, you are missing a riveting read). On my second pass, I took more time to read the captions and to appreciate the settings and people other than the principals who populate each picture. Three things stuck out. One is that movie stars and race car drivers of that day were physically attractive people. The drivers suits of the time were positively virginal compared to the billboards worn by today’s heroes. So the driving suits, the young fit men, the cars of different colors and shapes and the pits or straights of Le Mans all contribute to creating an idyllic image of what real sports car racing was all about. 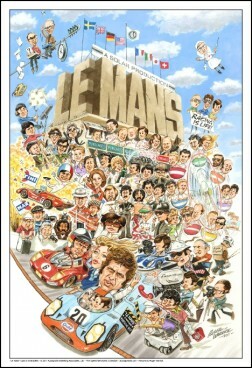 The images of the support people and the film crews seem pedestrian and out of place, as well they were, when contrasted with the complete Le Mans racing scene. The Steve McQueen film Le Mans is an iconic presentation of the Le Mans 24 hour race and the Porsche 917 vs Ferrari 512 rivalry in the late 1960’s and early 1970’s which most of our readers have seen again and again. Some have purchased and viewed Michael Keyser’s $29.95 DVD about making the film which, by the way, is excellent. 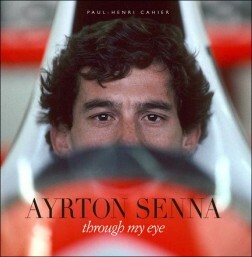 Michael, a winning driver, a photographer and journalist, presents a collection of dramatic full page photos of moments in the film production. There are actor and actress photos, discussion photos, racing photos, staged racing photos, crash photos, technical film technique photos and more. A fascinating book to enjoy and a great companion to the actual movie and the DVD about making the movie all of which would be a great addition to every vintage racers media collection. Arguably one of the most influential racing feature films of all time, Steve McQueen’s Le Mans did not enjoy critical or financial success when released in the early ’70s, but it has gone on to become a cult classic for racing fans ever since. 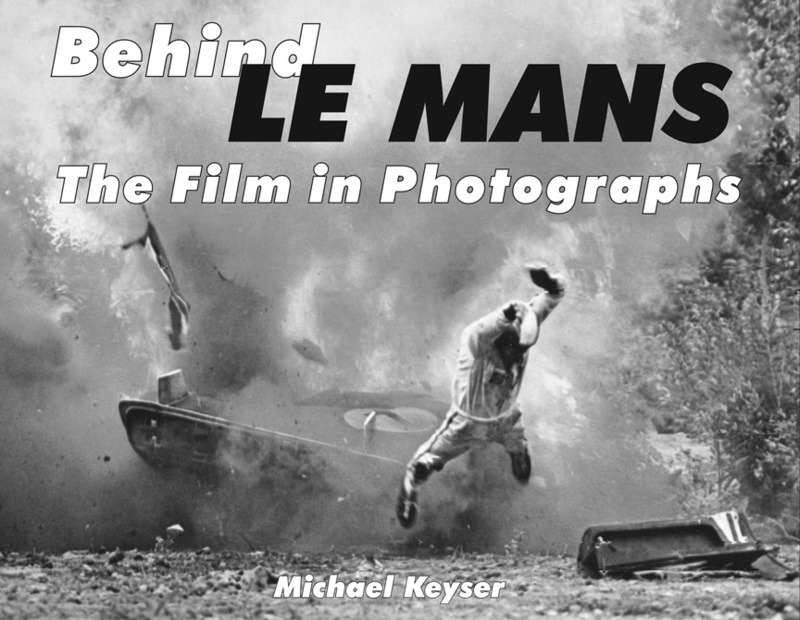 In “Behind Le Mans,” Michael Keyser has assembled a fascinating behind the scenes look at the making of this film utilizing photographs taken on the set by renowned photographer Nigel Snowdon, as well as those taken by cast members such as Derek Bell and Jonathan Williams. Each of the 200 pages features a single 10″ x 7.5″ black and white image richly reproduced on gloss paper. The reproduction quality is fantastic, but even more interesting are the behind the scenes images of McQueen and a veritable Who’s Who of 1970s racers who were used as stunt drivers and extras in the film, drivers such as Dickie Attwood, Jo Siffert, Derek Bell, Masten Gregory and David Piper, who sadly lost part of a leg during a crash while filming. 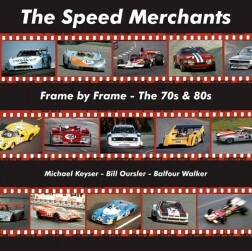 With images depicting how the pioneering in-car camera shots were achieved, or how the many crash sequences were staged, this book provides a unique glimpse into a film that has morphed over the decades from Hollywood flash to racing history.